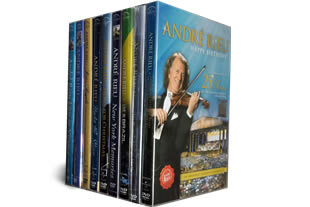 Andre Rieu DVD set. The complete collection on 9 dvd's. DELIVERED FREE IN THE UK. A great dvd collection of Andre Rieu and the Johann Strauss Orchestra. Dvd’s included in this collection are: Happy Birthday!, Live at the Royal Albert Hall, Live in Brazil, New York Memories, Home for Christmas, Under the Stars, Wonderful World, In Wonderland and Live in Vienna. 9 DVD Set delivered to your door.